This books deal with (Mudra Vigyan), the science of fingers postures which occupies a very important and prominent position among the ancient Indian Sciences. The science of Mudra Vigyan is deeply mysterious and amazing. In this book, the author has mostly deal with science of elements. Mudra Vigyan, it is not difficult to harmonize the undercurrents of the mind. Through this science it is also not difficult to achieve concentration of mind. Mudra Vigyan is most important aspect of the meditation of the supreme self. Here, Yog Mudras (gestures)are being presented as miraculous remedies, which affect some illness like an injection. Mudras can cure almost any ailment from a simple earache to heart attack. Earache can be cured in just a few minutes, by the Shunya Mudra. Similarly, many urinary infections will be cured by the Apan Mudra. In the case of severe heart attack, Mritsanjiveni Mudra provides instant relief within a few seconds. 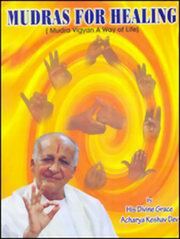 In this book, the author has discussed about some very useful and effective Mudras in detail, which are very useful in curing disease. Each description the Mudra is accompanied with relevant illustration, which makes the matter easy to comprehend. Yoga Vibhuti Acharya Keshav Devji is among one of those renowned great men, who has through his meditation and learning achieved the impossible. Such an enlightened and illustrious spell-performing sage, endowed with heavenly powers and an accomplished sainthood is very seldom seen. His knowledge and deep understanding can make one familiar with our fathomless ancient Indian traditions and erudition. He is the savant of Indian Yoga, Music, Mudra Vigyan, Pran Vigyan, Paradhyan Sadhana, Telepathy, Tratak, Kundalini, Astrology and its various branches, Ulka Dhumraketu, Angvidya, Bugarbh Vigyan (Geology), Astrological Predictions, Mantra Vidya, Yagya Vidya, Ayurveda, Ratnachikitsa, Pran Vinimaya, Theosophy, Nature Cure, Divya Chikitsa, Brahma Vidya, Shabd Vigyan and many other allied sciences. It is difficult to fathom the depth of His Holiness Achrya Shri's divine knowledge. He is endowed with virtuous piety leading an austere life. His life is full of worship, meditation and Yoga. His Holiness Acharya Shri's ambition is to unravel the secrets of the sciences of our ancient Indian culture-Yoga, Karmkand, Astrology, Veda, Upanishad, Mantra and the entire knowledge of the perceptible and the imperceptible among the common people of the world. He has, after many years of rigorous meditation and hard labour, experimented and discovered the pure and genuine scientific secrets of our Shastras.